Sneezing, coughing, scratchy throat, achy, and fussy, colds happen to all of us. We women think we can push through anything, but sometimes we need a little tender loving care, too. 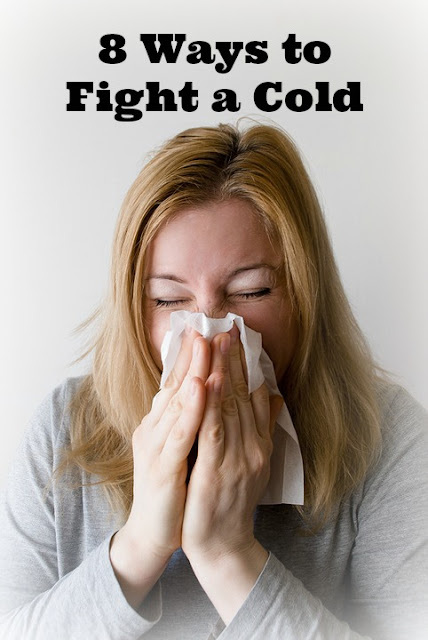 At the first sign of a cold coming on, get right in the fight. A Bit of advice from Momma Laura. Garlic—any way you can get it in you. It's a natural antibiotic. You can even cut it up in little pieces and swallow it like a pill. You can peel a clove and put it in your ear with a band-aid over it for ear aches, too. Don't shove it in! Keep it in the outer part of the ear. Elderberry in any form. You can even get capsules at Walmart. Chicken soup—it's just good for you in so many ways. You may not be able to avoid getting a cold, but lessening the symptoms or shortening the duration can make a big difference in how you make it through. Don't forget the most important get well tip of all—pray! Airborne tablets help if you start at the very beginning of your cold. All very good advice! Always makes you feel better too if a good friend stops by with soup and a good book to read. OH yes! Ginger Dawn. That would be lovely. My friends seem spread out all over. I live outside town without neighbors nearby. We take one dose of 3 drops of Plague Defense from Hopewell Oils .com in a capsule and the cold virus is knocked out in just a few hours. Such a relief not to have to be sick! I am so glad I do not get colds! I have enough trouble with allergies. Come to think of it. would I even know I had a cold with these silly allergies? LOL! I just did that with garlic the other day! I think it helped. We love our Puffs with lotion tissues and I have a nasal spray puffer filled with salt water., these help. I love these tips! Sometimes, we can't avoid it, as you said, but it is wonderful to have relief while going through it. I also use lots of Thieves. ​Would you believe it? The day this posted, I got a cold! I'm missing the Super Bowl party at our friends' house tonight. Home alone and feeling like Cinderella. Great advice!!! Thank you for sharing these- especially elderberry capsules!!!! I've only ever take the syrup! I'd much prefer capsules! Thank you!!! Thanks. God bless you and your home with health and strength in Jesus' Name! Such great tips. I eat a lot of garlic. I could eat more. I am not a fan of honey though. Hmm. I enjoyed reading this. I wish you had posted so we could have linked in January. We'll have to remember next year! BTW the new link is up now! You are ahead in points for My Happy Birthday To Me Giveaway! Yay! Glad I shared the posts. It's been a while since I've stopped in, but so glad I was able to catch up today. The tips you posted to relieve a cold are terrific. I also want to thank you for your recent book reviews. I am looking forward to adding some of them to my reading list. Lastly, how you must be proud of your son's ambitions. Law enforcement is a noble profession and I pray he has great success. I just feel tickled to my toes with your sweet comments! Thank you. I'm sitting here with garlic cloves in my ears since my throat is sore. After this post published, I started feeling sick! Since my little sister has been going to school instead of being home-schooled I feel like I have had one cold after the next from all the germs she's bringing home! I will have to make a checklist of this and try every single one next time! Haha. Thanks for the ideas! I'm not sure where I picked up my cold. I do know that we have fewer colds than many families since we homeschool. Yes, This is my sister's first year in school and I definitely notice a difference! Be blessed Johanna, and may God strengthen your entire family's immune systems. In Jesus' Name. My friend is a doctor and swears by Cold-Eez. She puts them in stockings every year!! I now keep them in the house at all times. It does seem to lower the duration of a common cold. Unfortunately, it didn't make a dent in the bacterial pneumonia we got this year. Pfft! I'd love to hear more about the elderberry capsules. Do you take them all the time or just when you're sick? I've heard about the syrup and wondered....thanks! I just take the Elderberry when I'm sick. I wish I had some now! I have tried garlic and it works!